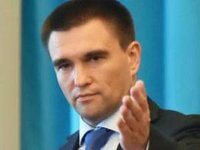 Minister of Foreign Affairs of Ukraine Pavlo Klimkin has announced the threat of an ecological catastrophe in Crimea occupied by Russia. "Russian invaders brought to Crimea and Donbas the human tragedy, now they are provoking environmental disasters destroying our land," Klimkin wrote on Facebook on Tuesday. In addition, Ukrainian Parliament Commissioner for Human Rights of Residents of Crimea and Sevastopol Ismail Khalikov said on Facebook that there was a leak of unknown chemical substance in the north of Crimea in the early hours of August 24. "Today, on September 4, there was information that the concentration of sulfur dioxide in the air exceeded the norm, but there is no data to what extent this norm is exceeded," Khalikov wrote. He recalled that the occupation authorities of Crimea in the person of the so-called "head" of Crimea Sergei Aksyonov announced that the Crimean Titan Plant had been halted for two weeks, and the evacuation of children of the region to Crimean resorts had begun. "It is worrying that the state of emergency has not been declared yet, the adult population is not being evacuated, and the invaders continue to "reassure" people," the representative of the Ukrainian ombudswoman for the rights of Crimean inhabitants added. He also said that according to information from inhabitants of Crimean cities of Armiansk and Yany Kapu (renamed Krasnoperekopsk) a yellowish tinge-like oily plaque was formed on the roofs of houses, metal objects in the apartments, and the appeals of citizens to hospitals with complaints of cough and inflammation of the mucous membrane of the mouth, nose, throat and eyes have increased. "There is a strong acid smell in the air, dead birds lay on lawns here and there," he added. Khalikov said that this information was sent to international organizations of the United Nations, the OSCE, the World Health Organization and the Red Cross "for the purpose of documenting the facts of human rights violations", as well as the Prosecutor's Office of the Autonomous Republic of Crimea (based in Kyiv) to initiate criminal proceedings against persons involved in the violation of the environmental rights of citizens in the temporarily occupied territories of Ukraine and the threat to their lives. A criminal inquiry was launched into the discharge of toxic agents in the air in northern Crimea, the press service of the regional investigative department of the Russian Investigative Committee in occupied Crimea said on Tuesday. The criminal case was re-qualified under the Russian Criminal Code article for violating the rules of scrapping environmentally hazardous substances and waste. The occupation authorities of Crimea announced on September that the large chemical plant producing titanium dioxide located on the occupied territory of Crimea in Armiansk, now a branch of Titanium Investments LLC, would be halted for two weeks over exceeding the threshold limit value for sulphur dioxide in the northern part of the peninsula. In addition, for the preventive purposes all children of school age, preschool age will be sent to Crimean sanatoriums. Armiansk residents have been posting their mass complaints on the social networks about the rust-colored ash, which has covered some parts of cars, fences, gas dispensers, keys, kitchen utensils and metallic items since August 24. Meanwhile, leaves are turning yellow and are falling from trees ahead of time. Several city residents are saying that their children have a skin rash and nausea, are coughing and have a sore throat.